Kofi Adomah Nwanwani, says he will drag social media Evangelist, Rev Addai, to court for accusing him of using Ama Martha for a sacrifice. Ama Martha is a young lady who was accused by his family members, led by his father, as a witch and was ostracized to live alone in a deep forest. The 26-year-old Ama Appiah Martha, according to her interview she had with Kofi Adomah claimed her family blame her for every misfortune that happens in the family. She lived in the forest for two years where she had three children without the help of any medical practitioners. 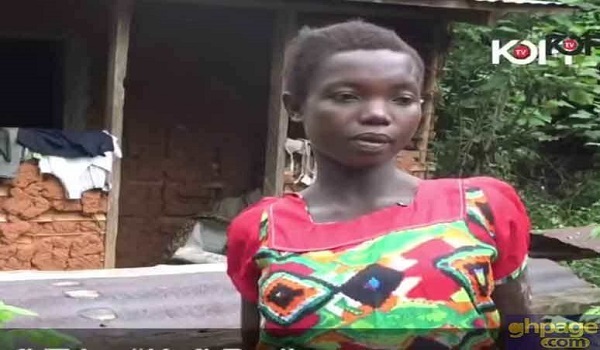 Ama was said to have delivered on her own, cut the umbilical cord and tried to go through postpartum all by herself, leading to the death of all the three babies. Kofi Adomah in a reaction to the accusations leveled against him by Rev Addai said he couldn’t sit down for the social media evangelist to tarnish his reputation. He said on his initial thoughts, he wanted to ignore him but upon reflecting on the biblical passage that “Answer a fool according to his folly, lest he be wise in his own eyes” (Proverbs 26:5), he felt he needed to deal with him. “WE CANT SIT DOWN FOR “EVANGELIST’” ADDAE TO TARNISH REPUTATIONS. “Do not answer a fool according to his folly, lest you also be like him” (Proverbs 26:4). “Answer a fool according to his folly, lest he be wise in his own eyes” (Proverbs 26:5). Time is up for him this time. I can tolerate him but others who might want to do good will be scared to. This time he has gone too far. The lines are drawn now. My Kofi TV Viewers, Colleagues, and even Ama’s family can testify all I wanted was for the late Ama Martha to be happy and succeed in life. I was very transparent in all my dealings in Ama’s case and I was not alone in this, there was a whole team working on this project to give Ama the good life which was denied her in the forest for two(2) whole years. But as we all know, God’s ways are not our ways. The entire Kofi TV team, everyone who supported this cause and Ama’s family are going through a hard time at this moment and the last thing we need is this kind of drama.